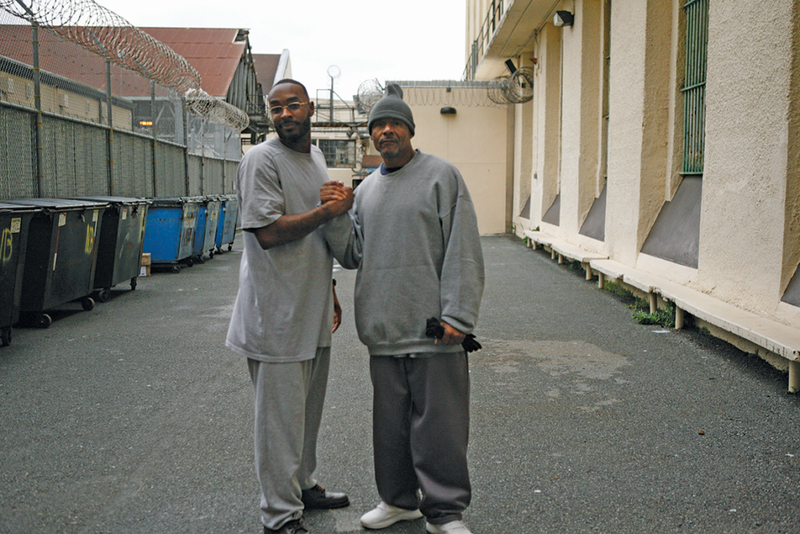 A New Year’s Day handball tournament on the Lower Yard at San Quentin led to new doubles champions. “They couldn’t stop the left,” said David Clout Wilson, as the sun radiated down on his smiling face. Clout, and handball partner Eric “E-Man” Post went undefeated in the tournament to take first place over the top four best teams. Their trophy was a statuesque box of granola bars. Jeff Williams and David Mageo took second place. Williams, partnered with various other people over the years, has won several past tournaments. It was a perfect day to play. A small gleeful crowd of about 20 handball enthusiasts gathered from 9 to 11:00 a.m. to take part in the competition. Clout’s winning strategy — hit the ball so high his opponents couldn’t reach it. “I don’t play handball. I play highball; I can reach the sixth pillar,” said Clout, while pointing behind him to an old reddish-brown, chimney-like brick pillar protruding above the wall beside the handball court. The pillar is about 40-50 yards from the handball wall. Clout hit the ball so hard, it flew past his opponents like a cannon shot. Post and Clout recently teamed up after discovering, through playing each other, that they were two of the best players on the yard. “We play each other all the time, and I always beat him,” Post said grinning. According to Post, he coaches Clout, who is 6-foot-4 and 230 pounds, how to use not only his power and height, but strategy ,to beat his opponents. Both Clout and Post love the game. Clout said it helps him build camaraderie, and it relieves stress. Fellow handball players, like Mageo, have given Clout pairs of old sneakers to use on the handball court. Post added that it’s a game where OG’s can still be a factor. “It’s (handball) not just a young man’s game; it’s a wise man’s game,” Post said.